The Abbey Burger Bistro is located in the heart of Baltimore's Federal Hill neighborhood. 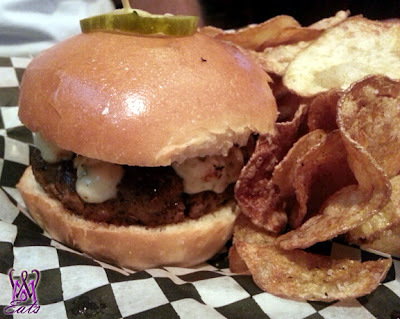 Tucked away at 1041 Marshall St (off Cross St, directly across from the market), the Abbey offers an enticing selection of flavors for any burger palate. From locally raised Roseda beef for the purist, to venison, duck, alligator, or more for the adventurous type, the Abbey has something for everyone. If you're feeling creative, you can build your own, or simply choose one of the tested and proven classics and leave it to the chef. The Abbey also features a wide selection of local, domestic, and imported beers and microbrews, as well as an expansive bar. The Abbey is also a destination for sports fans. With twelve screens spread across two floors of bars, there is plenty of seating on game day. After the baseball game, we were hungry and walked about a mile over from the stadium to the Federal Hill area. Lined with restaurants and bars, we found the Abbey tucked away in an alley. We were seated in the upper level, that was dim with a small bar area and walls lined with flat screen TVs. The server/bartender immediately pointed out the "day's specials" marked on the chalkboard, which listed wild boar and duck burgers. He also explained we could order off the menu or build-you-own burger using the paper and pencil provided. To start, I wanted something with crab (we were in Baltimore, after all) and noticed the Crab Tots. Since the burgers came with homemade potato chips instead of fries, I thought it wouldn't be so bad to starch up on these little guys. 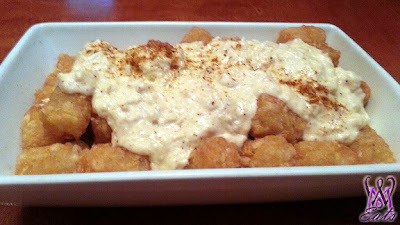 A large bowl of tots covered with creamy crab dip came out pretty fast and piping hot. A sinful bar treat, these tots were hard to put down but I knew I had to restrain myself to save room for the Homemade Veggie Burger that I ordered. The patty was an odd mushy mixture of corn, mushroom, onions, and perhaps rice. 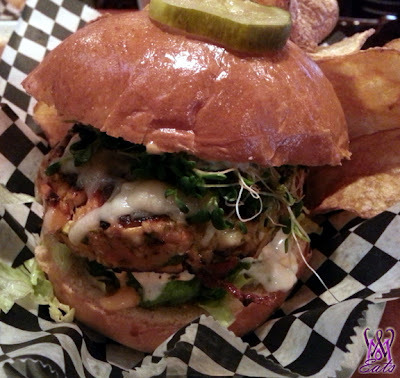 It was topped with Gran Queso cheese, chili pepper mayo, lettuce, sprouts, avocado, herb yogurt, and a roasted pepper aioli. A lot of stuff going on! The burger was piled high, so I removed the bun, and found the insides to be quite spicy, probably from the chili pepper mayo. The avocado was plentiful and provided a nice cooling balance. The potato chips were decent, but some pieces were chewy rather than crispy, so I skipped eating those as I had my fill from the tots. Keith ordered the Black and Bleu Burger and found it was cooked well, but was a little plain without any lettuce or tomato. It looked small next to my large veggie burger. He also ordered an alcoholic milkshake called Berger Shake that was made with Berger cookies, vanilla ice cream, Stoli vanilla, and Godiva liqueur. It reminded me of a thick chocolate martini-type drink, that my aunts would really like. The alcohol was much more prominent in these shakes than the "adult shakes" at Ted's Bulletin or Burger, Tap & Shake. It was a decadent accompaniment to the heavy burgers and tots. I left feeling incredibly bloated and a bit worried if I could make the 2 mile trek back to where we parked the car. But luckily the weather was gorgeous, and the exercise would do us some good after engorging on such a debauched meal. 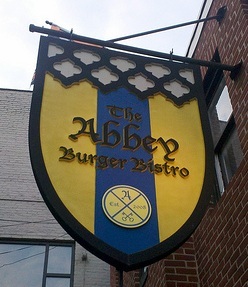 The Abbey seemed like a cool spot to meet with friends and watch the games, while sharing unique burgers and bar fare.